All the fun and none of the fuss, these short beginning classes introduce you to working with glass and ceramic tiles as you create a mosaic. Leave your designed mosaic with us to finish and you get to pick up your masterpiece a week later. Click here for details and upcoming schedule. 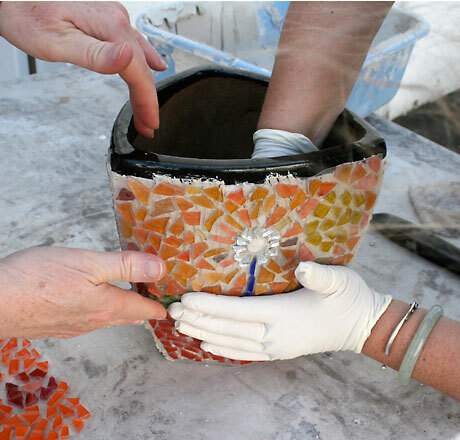 This two day workshop teaches you all the basic steps for making mosaics, from designing through grouting, using the traditional double indirect method. We guide you through the process, step by step as you create a beautiful mosaic in the process. Click here for more details and class schedule. Fusing glass is fun, beautiful and can bring a whole new dimension to your mosaics. We offer many different ways to learn about and play with fusing glass, either to make elements to work into your mosaic, or to create stand alone beautiful glass pieces. Become a member Become a member to learn and work at your own pace, create professional-level mosaics or simply support and become part of the SMA community. Check out our Membership page for more details. Schedules can be crazy. We’re happy to try to accommodate yours. Private sessions and workshops can be arranged for groups or individuals. We offer a wide variety of special workshops and intensives with both local and international artists for all level of mosaic artist, from beginner to professionals. Check out the dropdown menu under learn to see what we have currently!